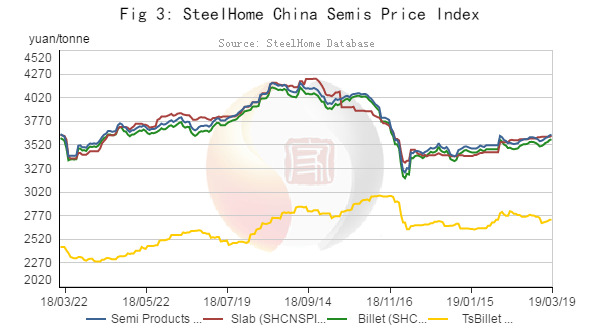 Construction steel: domestic construction steel in 28 markets averaged price hiked by 11-15 yuan/t. 20mm HRB400 rebar averaged at 4043 yuan per ton, up 11 yuan/t from previous trading day. Price hiked by 10-30 yuan/t in East China, Central South China, North China, West China and Northeast China markets. Medium plate: 20mm Q235B medium plat price averaged at 4045 yuan per ton in 28 domestic markets, up 8 yuan/t from previous trading day. Among them, price went up by 10-30 yuan/t in East China, Central South China, North China, Northeast China and West China markets. HRC: Price saw hike. 5.75mm Q235B HRC average price was increased by 6 yuan per ton to 3928 yuan per ton in 28 domestic markets. 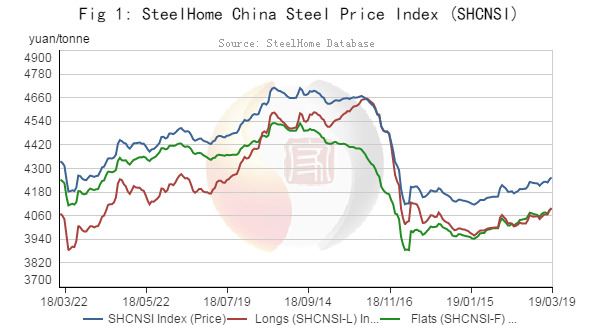 Price headed up by 10-70 yuan/t in East China, Central South China, North China and West China markets except 10 yuan/t reduction in Shenyang and Changchun markets. CRC: average price of 1.0mm SPCC CRC was 4429 yuan per ton in 28 domestic markets, up 12 yuan per ton from previous trading day. Price basically hiked by 10-60 yuan/t in East China, Central South China and West China markets, while price in North China and Northeast China markets was stable. On 19 March, Tangshan common billet price was increased by 10 yuan to 3540 yuan per ton, (cash, tax included, ex-works). Spot products in Tangshan billet market were priced at 3580-3590 yuan per with flat transaction. On 19 March, iron ore markets saw little change. 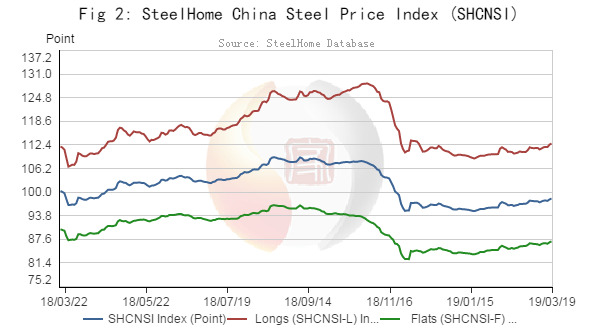 SteelHome data showed that China Domestic Iron Ore Price Index (SHCNDOI) 65% was 757 yuan per ton, unchanged and SteelHome Imported Iron Ore Price Index (SHCNIOI) 62% was 87.71 dollars per ton, up 0.01 dollar/t. Spot ore transacting price kept stable at China ports, For instance, PB fines trading price was 635 yuan per ton at Lanqiao port and mixed fines at Tianjin port were traded at 596 yuan per ton with plain transactions. 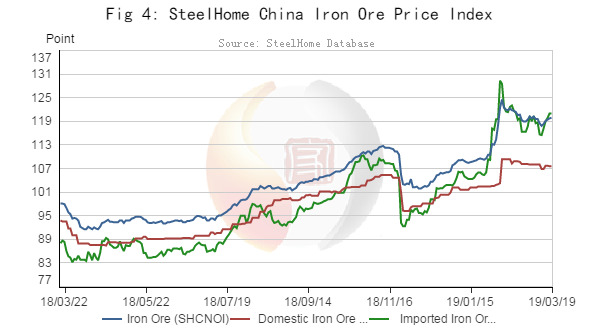 Seaborne iron ore markets fluctuated. COREX trading price was 1.5 dollars higher than averaged 62% Platts index in April for 0.17 million tons PB fines with laycan during 5-14 April 2019. 49 steelmakers released ex-works price policy on March 19, 2019. Chinese Major Steelmakers Profile (2018 Updated).